Leading manufacturer of fibre optic cables, equipment and accessories, AFL Telecommunications has received a total of eight patents for developing new products and technologies within the fibre optic cable, connectivity and test and inspection divisions. AFL’s fibre optic cable division received two patents. The first, titled ‘ultra-high fibre density micro-duct cable with extreme operating performance,’ is for outside plant MicroCore. The ultra-high fibre density micro-duct cables utilise 48 (250 µm fibre O.D.) or 72 fibres (200 µm fibre O.D.) per tube, while maintaining the 3mm buffer tube O.D. These designs operate within typical OSP temperature environments, are suitable for mid-span access, and can withstand significant compression and impact loads. The second patent is for ‘Round and Small Diameter Optical Cables with a Ribbon-like Optical Fibre Structure’. This is an expansion of the use of the SpiderWeb Ribbon technology and provides additional value to customers enabling them to take advantage of ribbon splicing and fibre organisation without sacrificing cable size or flexibility. 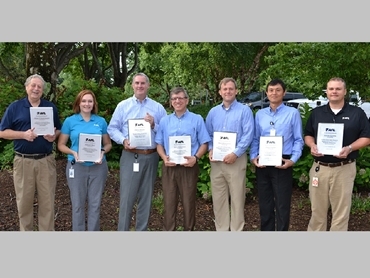 AFL’s test and inspection division received four patents. The first was for ‘Optical Fibre Test Apparatus with combined light measurement and fault detection’. This invention encapsulates the integration of a Visible Light Identifier with an Optical Power Meter providing users a fast debug/troubleshooting capability. The next was for ‘Shooting long fibre spans with high loss fibre’, which was developed to provide per-event detail on high-loss/long-span fibres beyond the standard capability of an OTDR (e.g. > 70dB). The solution combines the capability of an OLTS and OTDR to create an overall detailed long-span trace. Another patent was received for ‘Method for pre- and post-image association in fibre optic inspection’, the features of which provide users with the ability to pair fibre end-face images (e.g. Before/After, PC/BH) supporting better documentation and reporting. The patent titled ‘Distributed test system architecture’ applies to distributed architecture, which separates a test and measurement system into key components, of which all are interchangeable on a hardware and software level. Finally, AFL’s connectivity division received two patents. The patent titled ‘Optical Connection Terminals for Fibre Optic Communications Networks’ allows AFL’s multiport terminals to connect directly to AFL’s broad line of ADSS cables, making long span aerial deployment available for FTTx applications. The patent titled ‘Optical connector attachment tool having light transmissive wedge’ further enhances AFL’s portfolio of field-installable connectors. This technology provides a clear indication to the technician that the connector is fully-engaged with the fibre. For more information about AFL, its products and services, please visit www.AFLglobal.com.